Chocolate is woefully under-represented on this blog compared to the role it plays in my life. I’d say I eat chocolate almost every day, sometimes in moderation and sometimes, frankly, not. But most of the chocolate I eat these days is in pure, unadulterated bar form. I don’t bake with it much anymore because, in a perplexing twist of fate, I have a child who doesn’t like chocolate. She spits out a cookie, face twisted in disgust, if she finds an errant chocolate chip in her mouth. It’s unfathomable to me, but I work with it and mostly bake without chocolate. So when I make something chocolate, I like to go all-out. These cookies are all-out. Are you still mulling over what nice thing to do for your dad for Fathers Day? Skip down to the ingredients list and start baking. The brookies (brownies+cookies=brookies) recipe on this site is one of my favorite chocolate cookie recipes. This is the other. Those are chewy; these are a decadent, chocolatey, crumbly sable, packed with chunks of chopped bittersweet chocolate. The recipe comes from French pastry chef Pierre Hermé, Dorie Greenspan published in her book Baking: From My Home to Yours, and I found it via The Splendid Table. Thank goodness. The only warning I will offer is this: the dough can be quite crumbly, and if it is too crumbly it will be difficult to slice into cookies. I have read that using high-quality cocoa powder makes the dough easier to handle, but I used up some decidedly low-quality cocoa powder this time and the cookies came out fine. If your dough is truly too crumbly to form into logs, stir in a spoonful of milk and the dough will come right together. You’ll lose a tiny bit of the light, sandy texture, but the cookies will still be delicious. Chocolate Chocolate Chip Cookies: Sift 1 1/4 c. flour with 1/3 c. cocoa powder and 1/2 tsp. baking powder. (Confession: I never sift my flour. But I DO sift cocoa powder, since it can be lumpy, and here I just combine the dry ingredients and sift them together.) Put 11 Tbsp. room-temperature butter in the bowl of a stand mixer and run it for a minute until butter is creamy. Add 2/3 c. brown sugar, 1/4 c. white sugar, 1/2 tsp. fleur de sel (or 1/4 tsp. fine sea salt), and 1 tsp. vanilla extract, and beat on medium speed for 2 minutes. Add the dry ingredients and mix on low speed just until the ingredients are combined into a crumbly dough, about 30 seconds. Add 5 oz. chopped bittersweet chocolate and mix briefly one last time. Place two 16″ sheets of plastic wrap on the counter and divide the dough between them. Form each into a a log about 1 1/2″ in diameter and tightly wrap each in plastic. Refrigerate at least 3 hours, or up to 3 days, or freeze up to 3 months. Slice dough into 1/2″ rounds, just patching them back together if they crumble. Place 1″ apart on a cookie sheet and bake at 325 for 12 minutes (add a minute or two if you’re baking them from frozen), until the tops look dry. Transfer the cookies to a cooling rack and have a glass of milk ready when you serve them. This entry was posted in Baking, Cookies, Desserts, Feeding Kids, Food, My Favorite Recipes, Recipes and tagged chocolate, chocolate chips, cookies on June 16, 2012 by emmycooks. My all-time favorite cookie has to be chocolate chocolate chip. Any way to cram more chocolate into a treat is fine with me! I never heard the *Brookies* until now and I think it is the perfect name for these cookies. I am also a big fan of Doris Greenspan and had tried a few of her recipes from her baking book. Did you use the natural (like Hershey’s) or dutch processed cocoa? Looks fantastic. I love your description of the texture too. These look DELICIOUS! Love the touch of the pic with the jar of milk. Oh, yes. These cookies absolutely require milk. Are these the famous “world peace” cookies from dorie greenspan?!? 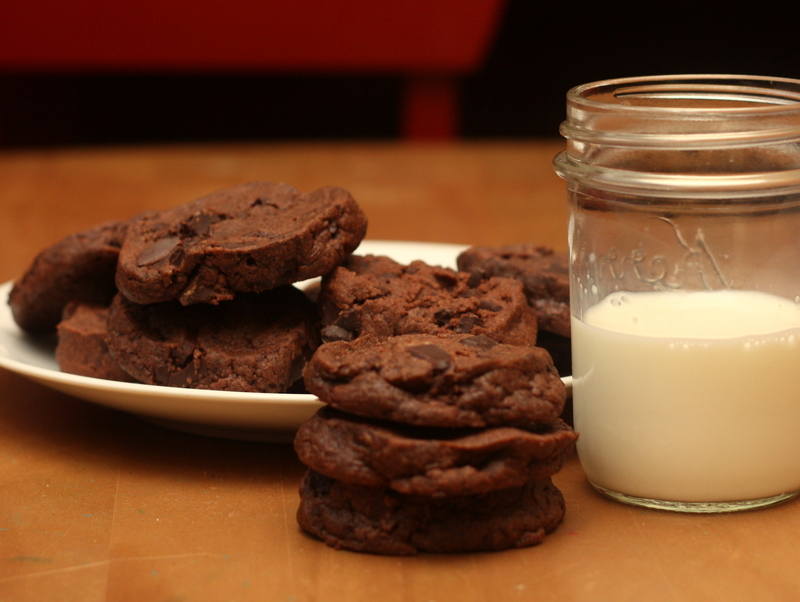 I have been dying to make these forever… crumbly sable cookie with double chocolate, mmmm. I definitely have got to make these soon. Thanks for posting! This looks and sounds delicious! I am totally going to try them…YUM! They are quite outstanding. And quite chocolate! I’m the only member of my family that adores cookies. It’s good and bad, because I end up baking them infrequently so I don’t eat them all and have been tooling with smaller and smaller batches. However, I think a remake is totally in order of this recipe. Yay for brookies!!! I love these because you can freeze the logs and slice and bake a few at a time. I imagine that that would work in a vegan recipe as well (or if the texture doesn’t hold together in a log, you can form the cookies and freeze them on a tray and then dump them frozen into a bag; just add a few minutes to the baking time if you’re baking them from frozen). How did I miss this earlier when you posted? They look sooooo good and sound even more delicious. I am saving this for when I’m going to be able to eat sugar again (4 more weeks). I am counting the days! Good for you for taking a break from sugar–that’s definitely a good idea from time to time!